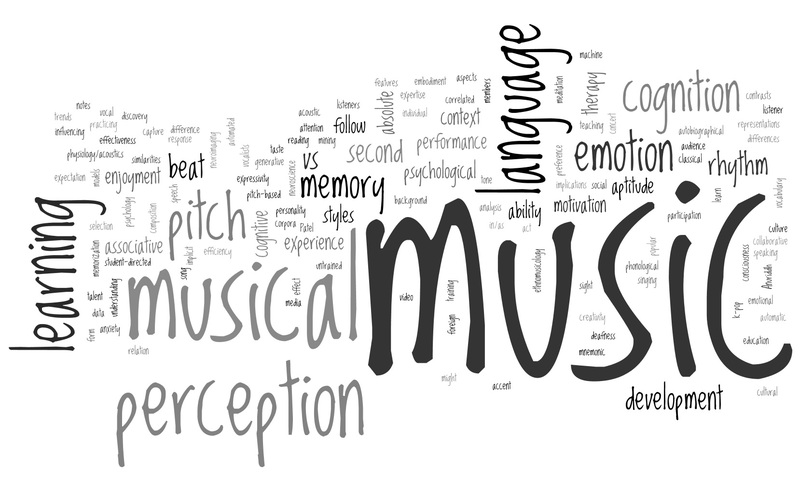 I wanted to write a quick post to share my excitement about a new research group starting up at IU called: SMiLE: Science of Music in Learning and Experience. The purpose of the group is to cultivate conversations about music research among students and faculty across departments in the school of music and across units on campus. So far, interest in the group has been expressed by grad students and faculty from… …Music (education, theory, conducting), Cognitive Science, Psychological and Brain Sciences, Telecommunications, Speech and Hearing, Informatics, Computer Science, Linguistics, and Second Language Studies. This image is a wordle of the groups’ collective interests from our first meeting. Our first two meetings were interdisciplinary, collegial, energetic, and overall – lots of fun. Many thanks to the colleagues and friends I spoke to who encouraged doing something like this and gave such great advice about how to do it. Many thanks too, to the wonderful colleagues and students taking time out of their busy days to join in the fun! It’s sure to be a fun adventure and I’m excited for what the Spring may bring! This sounds interesting – would love to hear more about it. Definitely keep us posted on how it’s going!